" The Chief Minister of Delhi, Smt. 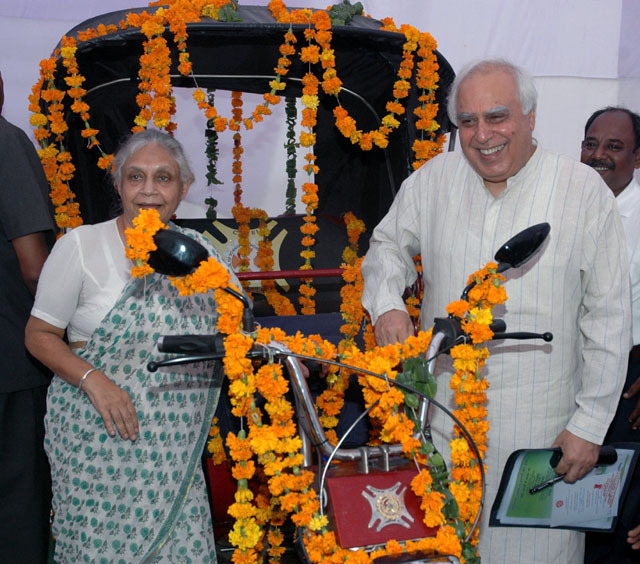 Sheila Dikshit, today launched “Solekshaw”, the solar-electric rickshaw for eco-friendly urban transport, at a function organized on the occasion of Gandhi Jayanti near the Chandni Chowk Metro Station here in the august presence of Shri Kapil Sibal, the Vice-President, Council of Scientific and Industrial Research, CSIR and Union Minister of Science & Technology and Earth Sciences. Prof. Samir K. Brahmachari, the Director General, CSIR was among the other dignitaries who were present on the occasion. The advanced versions of Soleckshaw Mark II and Mark III with better aesthetics, ergonomics, speed and recumbent driving position is expected to be ready for launch during the Commonwealth Games in 2010. Several R&D projects are slated to be launched in the areas of storage batteries, charge and speed controller, solar photovoltaics and hybrid transmission, in a network mode to make the future Soleckshaw, an engineering marvel. (Three Photographs available at www.pib.nic.in) "